Alexander Michael Hirst Aikman (Michael or Mike) was a teacher at Camberwell High School (CHS) from 1956 to 1959. Michael commenced his schooling as a day student at The Geelong College from 1939 to 1951. He was an excellent student and sportsman, representing his school in Athletics, Football & Rowing (Two Head of River Races), being Captain of Boats in 1951. He won the Music Prize and played in many of The Glee Club Productions. Michael studied Science at Melbourne University, gaining a B.Sc. & later a B.Ed. 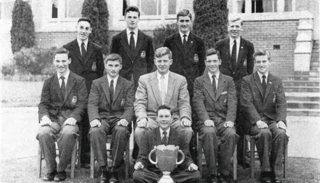 While at Uni he rowed with Ormond College, Melbourne University 1st Eight, Victorian King’s Cup Crew (winners in 1956) then gained a seat in the Australian Men’s Eight for the 1956 Olympic Games, which won the Bronze medal. Michael went to Camberwell High School to teach Chemistry, which as far as I recall, he never did. He certainly taught Physics in years 1958 & 1959 Leaving Certificate & Matriculation (i.e. years 11 & 12). Michael took over the Camberwell High School Rowing Club from Harold Begbie, he recruited more coaches, some ex-Geelong colleagues (one, Gordon Cowey, had also rowed in the ’56 Games), and rowing became a glamour sport for CHS, especially after winning the 1st & 2nd VIII’s in 1958 at the High Schools’ Head of River Race over the Henley course on the Yarra River. This was repeated in 1959 by winning the 1st, 2nd & 3rd VIII’s at the Head of River. Michael was an excellent coach and teacher, firm, positive no-nonsense kind of person, clearly able to achieve things he set out to do. When I was struggling with Physics after an intense 1st Term, he spent time with me in private study periods, setting me straight. I was lucky enough to gain a 2nd honour in that subject, enabling me to gain a Commonwealth Scholarship, a great boon to my Tertiary Studies. In 1960, Michael returned to the private school system, joining the staff of Scotch College, Melbourne to teach Chemistry (he took my Matric notes just in case he was a bit ‘rusty’). He also coached their 3rd Eight. Early in 1960 Michael was approached by Hawthorn Rowing Club (CHS’s sponsors) to put the 1959 1st Eight back together to row at the Mildura/Wentworth Easter Regatta’s as a Novice Eight, representing Hawthorn Rowing Club. If the crew won both races, it would enable Hawthorn Rowing Club to win the VRA Junior Rowing Championship. Despite his working commitments at Scotch College, Mike did this with only one seat change, 3 of us were at University, the remainder still at Camberwell High School. We won both races with very little training and the Hawthorn Rowing Club HRC were jubilant. 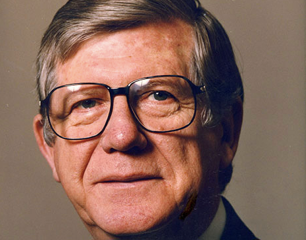 In 1962 Michael transferred to Trinity Grammar, Sydney to the position of Head of Chemistry and Boarding House Master. Then in 1966 he was appointed Headmaster of Scots School, Bathurst. This was regarded as a difficult appointment, but Mike embarked on an enhanced Music programme as he felt this increased a student’s self-confidence. He also increased the building programme. In 2018 Scots School Bathurst presented the musical ‘Oliver’ in the Aikman Hall. After 8 years at Scots School, Michael was appointed Headmaster of Haileybury College in 1974, where he remained until he retired in 1998. Michael was an amazing leader and educator at Haileybury and motivated all around him to improve the school buildings and academic performance. Once again music and drama became a constant theme. There is also an Aikman Hall at Haileybury, but the building of the Chapel is regarded as a landmark event of the Aikman era. This is the Chapel where Michael’s funeral service was held in 2005. It is stunningly beautiful. Designed by Philip Cox, with windows and murals by Leonard French, simply breathtaking. Michael introduced Rowing to Haileybury in 1990, and their inaugural crew rowed as a 1st VIII in 1991 winning the B Final of the APS Head of River. He told me he was disappointed they didn’t make the A Final and win it! Ever competitive! He also coached this crew, the first Headmaster to coach a first APS Eight crew since the early 1900’s. Michael was inducted into the Old Geelong Collegian’s’ Association Notables Gallery at Geelong College in October 2014. Michael Aikman was a man who had a great impact on the students he taught and the boys he coached.